Chinese characters are represented as pictograms which are based on the shape of objects. If you feel even slightly disheartened that you will have to memorize each one of them, then do not worry. Just as the English language learning system is based on alphabets (A, B, C, etc.) which are a set of characters that represent the phonemic structure of the language; similarly, Chinese learning has about 250 basic and radical characters. Remember that you can combine these Chinese characters or break them in order to easily read, write and understand them. How must one learn the basic characters? This book is written to help you understand the origin and usage of each character. Now you can recall instead of memorize. To remember means to strengthen the synapses which connect your brain cells. Synapses can be strengthened by stimulating the five senses - smell, hearing, taste, vision and touch. When multiple senses are used together, the memory lasts longer. Better results can be achieved when such stimuli is coupled by unforced repetition. One good way of strengthening the synapses is to repeat the same stimulation. This book expands on the basic character by adding parts that give new meaning in a radical form. This means you are exposed to the same basic character multiple times. The co-author of this book is KONG, Kyung-Yong. Although he was born in Korea, he is the 78th descendent of Confucius, and due to his family, he was familiar with Chinese characters since youth. He was a bookworm who perused over the Britannica Encyclopedia when he was just a boy. He conceived of writing a book with the idea that Chinese characters with form and sound can be easily learned if meanings are given to the sounds. His experience reading encyclopedias and countless books helped him assign scientific or social meanings to the sounds. He is a professional publisher active in the publication field, participating in diverse activities such as writing, editing, and consulting governmental agencies or universities. Dr. JIANG, Yong (蒋勇) - Professor of Chinese Language and Literature, Fudan University, Shanghai, China. "The authors of this book have conducted extensive research on Chinese lexicology, etymology, phonology and grammar, and now share their expertise with Chinese language learners. Learning Chinese characters takes more time and effort for those whose native language uses alphabetic writing systems. The authors solved this problem by reinterpreting some of Chinese characters in their own imaginative ways. 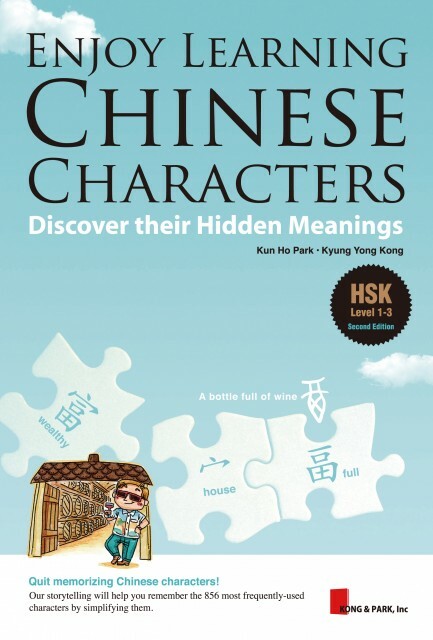 This extends readers’ horizons and helps them to make sense of the structures of Chinese characters through the use of interesting stories and fascinating cartoons. The characters in this book are organized around topics such as people, life, nature, etc. for the sake of easy recollection. The book helps learners to build their Chinese character and vocabulary base by grouping relevant characters and their associated words and phrases in a family in a systematic way. This book is an indispensable aid for people who want to master basic and commonly used Chinese characters and vocabulary within a short time. It is also a very useful reference book for Chinese language teachers." "Learning Chinese is a daunting challenge for new learners, both in speaking and writing. While the challenge of listening to and speaking a new tongue is common to all languages, written Chinese presents a challenge on a whole different dimension. While most languages require just the memorization of an alphabet to learn the basics of how to read, Chinese seems to offer no such tool. It seems like an impossible task to memorize how to read and write hundreds of characters, and many give up early on. In that regard, this book offers a unique tool. It provides almost an alphabet-like tool that makes it unnecessary to memorize each character individually, from scratch. It also makes it possible to guess at the meanings of characters that you have not even learned—making vocabulary-in-context learning of the Chinese language also possible. And its insightful commentary regarding the shape of each character adds appreciation for this beautiful language. I would highly recommend this outstanding tool to any new learner of Chinese." "Playful cartoons and amusing storytelling may deceive serious students at first glance, but this comprehensive collection of 800 of the most frequently used Chinese characters will allow the reader to move past pinyin and learn to fully understand and appreciate the ancient language still in use today. Make use of this new and exciting way to undertake the seemingly impossible task of memorizing Chinese characters! Characters are broken down by fun explanations, quick references, examples, and color coded notes that piece together puzzle-like parts to create a whole picture of understanding.. Several learning tools such as dissection of pictograms, stroke order, and vocabulary lists are included, to name just a few. Ideal for foreign students beginning to learn basic characters as well as for students preparing to take the HSK or Chinese Proficiency Test, this text will assist readers to further understand the meaning of all Chinese characters!"